"Believe me; one day we’ll look back to this time period as a golden era for restructural breakthroughs…"
I don’t know how it’s perceived in other countries, but opera is at least arguably seen as the most establishment of establishment art forms in the UK. It’s often the one wheeled out by way of contrast, for example, whenever the lack of funding available for jazz is discussed. The arguments seem usually to be couched in relative terms: it doesn’t tend to be discussed whether opera is funded the correct amount, and other musics just not enough in comparison; or whether it simply receives too much in absolute terms. And what is a shame is the fact that the concept of opera itself seems increasingly tainted by claims of elitism, simply by virtue of the amount of funding received by the institutions which stage it. I was going to comment on how beautiful it is, in this context, that we can find a work like Trillium J – The Non-Unconfessionables, created by such an outsider as Anthony Braxton. But the idea of ‘outsider’ doesn’t seem quite right; to me, that slightly suggests too much association with conventional channels (even if by opposition). Listening to this music, and his oeuvre as a whole, it’s clear that Braxton operates beyond convention: he is truly sui generis as an artist, and on reflection, I think there are probably precious few people of whom this can be said. Braxton’s creativity seemingly bypasses traditional modes of production. His vision is completely and disarmingly unimpaired by ideas of ‘the way things are done’, or more simply, by ideas of what is realistic. This has a very practical element. Braxton was of course fortunate to have major label backing early in his career – he produced a string of classic albums for the Arista label in the 1970s. (An interesting piece of work might consider the extent to which other artists have truly capitalised on similar opportunities: Braxton used part of the Arista budget to record his massive Composition No. 82, scored for four orchestras; one contention might be that some artists, by contrast, have allowed the majors instead to shape (sc. ‘blunt’) their creative trajectories.) On the termination of this deal, however, and after stints with imprints such as Leo Records and HatHut, rather than slow his production, he stepped it up, and created his own outlets (in an echo of the self-determination ethic shown, for example, by the early generations of the AACM, or further back, by musicians such as Max Roach and Charles Mingus through their Debut Records enterprise; Prince’s career, of course, is also relevant in this respect). Braxton House came first; its newer incarnation is New Braxton House. Braxton’s temperament is such that he is able to forge ahead with his work untroubled by practical considerations. It is not such a pressing question whether or not a performance of a composition for 100 tubas (Composition No. 19) is a viable idea, if that piece hasn’t yet been written. His vision, enthusiasm, and faith in creativity – whatever ‘America’ might throw at the creative musician – is such that for him, the thought that musicians might be stationed on different planets for a performance is not inherently any crazier than the thought that ‘how about we do this gig with piano, bass and drums.’ Hence his remarks in the Trillium J liner notes – light-hearted, for sure, but with an unmistakable sincerity of purpose – that the opera can be performed […] with any instrumentation that strikes one’s fancy – from an orchestra consisting of ten billion musicians (or more) all the way to a reductionist performance that consists of only twelve “bricks and a bucket” (smile). Certainly, we read elsewhere in the notes that future realisations of his operas may involve drones as part of a multimedia element, and it is very clear that this particular gambit is absolutely as on the cards as (say) that an oboe might appear in the pit for that same opera. In short: the question of ‘how’ necessarily comes second for Braxton to the concept itself. And it is worth noting in turn quite how often he finds a way to realise these concepts. "There’s a special kind of opportunity developing in this time quadrant that hints of a fresh era of change and cultural excitement." Trillium J – The Non-Unconfessionables is the most recently-released instalment of Braxton’s massive Trillium opera complex. Each opera is, in a sense, modular: it comprises a number of autonomous acts (this is a structural device shared with the operas from Karlheinz Stockhausen’s cycle Licht), which can ultimately be reconfigured, in a macro-level manifestation of Braxton’s ‘erector set’ concept for structural development. Trillium J itself comprises four acts (as indeed does its immediate predecessor, Trillium E: Wallingford’s Polarity Gambit). Though bracketed by the Trillium theme, these acts are, in other respects, not necessarily related to each other (in the case of each of Trillium J, Trillium E and indeed its predecessor, Trillium R: Shala Fears For the Poor, the theme is stated first on a solo wind instrument, followed by a full orchestral statement, with this order reversed at the end of the opera). In fact, an evening at the theatre in Ancient Greece, where the audience would see not one play, but four (usually three tragedies, followed by a Satyr play), could be seen as one loose analogue for this arrangement. 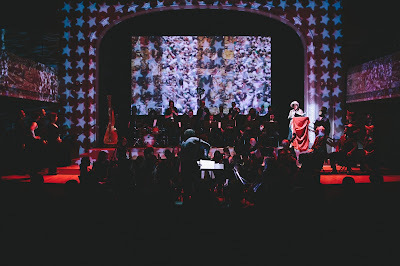 But just as Stockhausen was beginning to deal with concepts and structural conceits only loosely connected to the ‘grand’ opera tradition (take for one example the notorious Helikopter-Streichquartett which comprises Scene 3 of the cycle’s opera Mittwoch), so too are Braxton’s influences and ideals broader than the classical canon, narrowly construed. The Trillium series involves, for example, an entire mystery system, not unlike Wagner’s Der Ring des Nibelungen (which, although core repertoire in a sense, is hardly typical within the tradition); Alexander Scriabin’s bizarre last unfinished work similarly comes to mind. Braxton also acknowledges a debt to Walt Disney, dealing as they both do with fantasy worlds, dream states, multimedia, and plain fun. At the core of the Trillium cycle lies Braxton’s comprehensive philosophy, as articulated in his Tri-Axium Writings. This three-volume collection, published in the mid-1980s, contains thinking which continues to inform all aspects of Braxton’s work: both in its relation to the world ‘at large’, and in its more internal dynamics (such as language, structure, the composition of the group, and so on). These writings also contain the keys to beginning to understand some of the conceptual ideas encountered in the operas which at first may seem somewhat esoteric to the new listener (or ‘friendly experiencer’, in Braxton’s usage, reflecting his awareness of the multimedia possibilities for creativity, as well as the different levels on which people may choose to engage with his work at any given time). Trillium J finds Braxton, as ever, exploring form. There is a certain intrigue for the seasoned Braxton listener in dealing with the Trillium series. We’re used to Braxton’s daring with non-linear structures, for example, as manifested in the possibilities contained within the Ghost Trance Music and Echo Echo Mirror House Music (to take only two examples) for moving from the ‘master’ composition into other materials from throughout Braxton’s oeuvre. But on first blush, the operas appear to be outliers in this respect (and on one view, this would be enough in and of itself to make them structurally novel within the late Braxton soundworld): they seem to stay ‘on the page’ for their duration. Part of the answer to this has already been touched on: there is a macro-level structural game at play, where the individual acts comprising the operas can be reconfigured. But there are also fascinating ‘micro-level’ clues as to how the works may be treated in the future. And so in Act IV of Trillium J, we suddenly find ourselves temporarily transported away from the orchestral soundworld, and into an astonishing passage of Syntactical Ghost Trance Music (see also, for example, this release). And indeed, during this excursion, an episode of Double Dutch is interpolated on stage (note too Braxton’s mischievous reference in the liner notes to the possibility of involving the Dallas Cowgirl Cheerleaders at some juncture within the Trillium series). It is important to highlight at this point too that this set contains not one, but two realisations of the opera; one – a studio recording – on CD, and the other, a live Blu-Ray, recorded in performance at Roulette, allowing the viewer to see the jump rope sequence, as well as the many projections and other purely visual elements of the performance. Of course many, many operas are, or can be, highly visual, but issuing a performance on Blu-Ray is nevertheless another example of Braxton pushing at formal boundaries. Significantly, in the liner notes to this release, Braxton writes of his hope to harness the possibilities offered by the internet to enhance future experiences of his work. And as fans, we might also wonder: how could these possibilities be applied to works from Braxton’s past, such as Composition No. 173 (for four actors, fourteen instrumentalists, constructed environment and video projections)? "…the dynamic reality of cosmic transposition extends well past idiocentric parameters and/or isolated poetics." Listen to me buster. Originality doesn’t begin to describe my situation. "What about the stash of bazookas?" If this is to focus on the lyrical content of the piece, it shouldn’t detract from the orchestral writing, which contains some wonderful and completely original colourations (the same is true of Trillium E, moments of which do ‘ethereal’ like you’ve never heard before). There are also some very subtle gambits which mean that the writing really doesn’t sound like anything else other than itself: some special moments occur when you momentarily perceive one of the improvising soloists peep out above the predominant scored texture, or where Braxton conducts a fully scored passage, whilst the ‘synchronous conductor’ (Taylor Ho Bynum) momentarily seconds a cohort of musicians to play a series of directed contours/gestures. I’ve already mentioned the appearance of the Syntactical Ghost Trance Music passage. Another musical interpolation to the prevailing orchestral soundworld comes towards the end of Act I, when a jug band strikes up (do not adjust your sets). It’s at once one of the most bizarre moments in the opera, and one of the most Braxtonian, in its way. And this leads to another observation about the work: that at the same time as it is so all-consuming and original, as with so much of Braxton’s work, it is also extraordinarily ‘generous’: it inspires the friendly experiencer to think about all creativity, and not just the composer’s own. In the same way that a trip to the record stacks on listening to some Echo Echo Mirror House Music may in fact lead the ‘friendly experiencer’ to pull out a King Tubby record rather than some Braxton source material, so on some listenings to this opera, I found myself with all sorts of other pieces of music coming to mind. That jug band: when it started up, I thought once over about the itinerant Italian singer wandering into the court of Baron Ochs in Der Rosenkavalier, and the way the late Romantic German Richard Strauss soundworld immediately turns Puccini in that moment (Di rigori armato il seno). And as the jug band’s music dissolves, I couldn’t help but think of the way the Schubert soundworld turns into the Berio soundworld in the latter’s Rendering. And after listening to Act III on one occasion, I found myself going back to Benjamin Britten’s The Turn of the Screw. (It was probably just the creepy old house bit which did it.) But spending time with music like this will simply enthuse you to make these connections. Here’s another: two thirds of the way through Act IV, Kristin Fung’s Alva sings, accompanied by Ingrid Laubrock’s soprano saxophone; and I found myself thinking of Steve Williamson shadowing Black Thought on the classic Pf Fat Time. Believe me when I say they sound nothing alike. The media in recent weeks has of course been full of Shakespeare talk. But of those who left Spaceship Earth in 1616, it has always been Cervantes’ work which has really got to me on a personal level: I can’t think of a single more human character I’ve ever read that Don Quixote, or one with whom it seemed so easy to identify. Don’t get me wrong: the ‘quixotic’ idea doesn’t work 100% here; in particular, if you buy into Don Quixote as a fool, or his windmill-tilting as delusional, then 1) I think you’re wrong, and 2) don’t read on. But ‘quixotic’ I think touches on something central to Trillium J and its composer, insofar as we’re talking about idealism (a faith in the possibility of new forms of expression, and new media for their promulgation); insofar as we’re talking about ‘the journey’ (whether than be a literal narrative journey, or a new way of looking at journeying through form – whether musical, or the form of a career which has moved from the 1960s Chicago, via a major label and smaller, independent labels, into a period of more pronounced artistic self-determination); and insofar as we're talking about the dreamers and fantasists who are ultimately as real as it’s possible to find.